I found out about this book during this particularly excellent episode of the Get Booked podcast. It’s another branch of the Book Riot group and it has to be my favourite of all their podcasts, taking recommendation requests from listeners and sharing books they things would suit the question. I couldn’t possibly say how much money this show has made me spend on books, because that would force me to admit that I have a book problem… let’s just say….. some money has changed hands. This book is amazing, it’s not just a good read but a really fun experience. The book itself is laid out to look like an IKEA catalogue, complete with cover and illustrations and chapter headings inside so my appreciation goes out to the team who created this beauty as well as the author – good job, people! 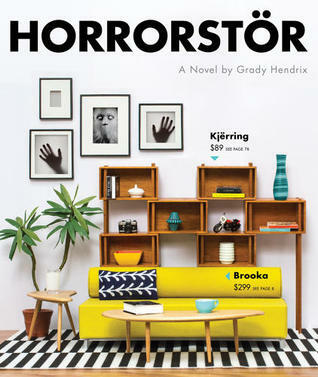 The story is your typical haunted house mystery, but set in a ‘we-all-know-it’s-IKEA’ Swedish furniture store called Orsk which adds an oddly enjoyable dimension to it, especially given my own personal hell of weekend trips to pick up furniture this year. It’s a parody of everything truly awful about a shop that’s kept young professionals in uncomfortable sofas and 50p potato peelers for years. I’m not going to give any of the story away, it’s pretty predictable if you’re a fan of the haunted house sketch but that’s not what makes this book so good – funnily enough, I find ghost stories to be one of my favourite comfort read genres but this book also has really well written characters, they manage to be very distinct and entertaining in personality without being too cartoonish. It’s the humour combined with the tension and suspense that Hendrix so aptly creates. This is a really well told story and in my opinion will make a fantastic Christmas present for anyone with even the slightest interest in ghost stories – it’s a very easy read and with its unconventional layout, really fun to have on your shelf. Certainly has piqued my interest!